← Gunblog Variety Cast .45! Images of the Antis: WTF??? 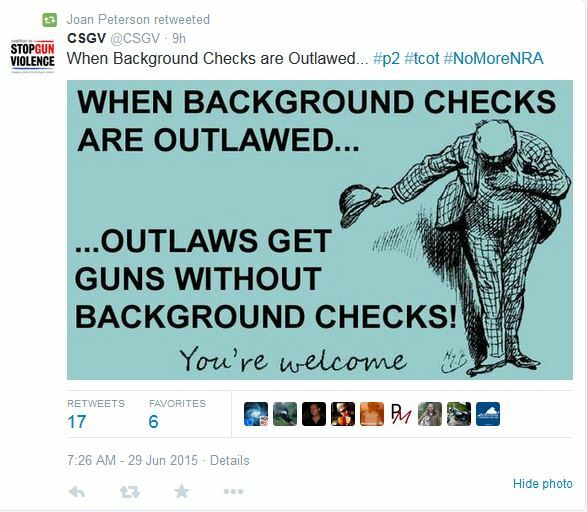 Maybe you would believe me, but that CSGV would put up this image, and Joan Peterson would retweet it. Um, Antis? Who the hell is talking about OUTLAWING background checks?????? Right now the only things the pro-gun lobby is talking about is not making background checks ILLEGAL. The antis are the ones talking about OUTLAWING private sale of firearms. Hell even a hard-liner like me simply wants to get rid of the Brady Background Check system because it’s essentially worthless, but even then I’d be getting rid of the MANDATORY background system. If you wanted to PAY for a background check…for any reason, you could. Just so obtuse! Seriously the anti-gun camp is being run by lunatics! 3 Responses to Images of the Antis: WTF??? It’s typical, change the frame of reference to make it look like the other side is the aggressor. At first glance it’s ludicrous of course: De-mandating =/= outlawing. But it’s consistent with the statist mindset wherein government intervention is the natural all-pervasive milieu, so eliminating an existing regulation is either equivalent to making a new regulation, or it’s even more of an active, aggressive encroachment on others. Classic straw-man. Take the opponent’s position, re-word it into a ridiculous and easily-refuted parody of itself, and knock it down. 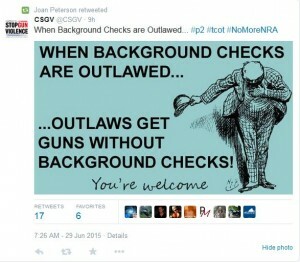 Nobody wants to “outlaw” background checks; nobody’s talking about that. Just like nobody’s talking about handing .45s to kindergartners to take to school, or requiring every male child to join a militia, or requiring every home-owner to own a shotgun. We just don’t want background checks MANDATED on ALL gun transfers. You know, this is actually accurate. Private citizens are outlawed from using the only background check system that counts (NICS*). Of course instead of just making it legal to do those checks, their solution is to outlaw private sales as well.